South Korea aims to join the ranks of spacefaring nations this Friday (Oct. 26) by blasting a small experimental satellite to orbit, according to media reports. The country will attempt to loft a test satellite atop its Korea Space Launch Vehicle-1 rocket, or KSLV-1, from the Naro Space Center on Friday, weather permitting, South Korean officials said Monday (Oct. 22). "We have confirmed after considerations of weather conditions and preparations for the launch that the launch will be possible on October 26," Minister of Education, Science and Technology Lee Ju-ho told reporters, according to South Korea's Yonhap news agency. "However, even through preparations will be made for October 26, the launch may be delayed if rainfall becomes imminent or very likely on the scheduled date." The upcoming launch will be South Korea's third try to orbit a satellite with the KSLV-1, which was developed jointly with Russia and is also known as the Naro-1. Previous attempts in 2009 and and 2010 failed. The spacecraft riding atop the rocket, called the Science and Technology Satellite-2C (STSAT-2C), weighs about 220 pounds (100 kilograms) and is designed to last up to a year in space. 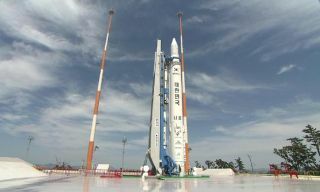 Its main purpose is to verify South Korea's ability to orbit a satellite and collect data in space, Yonhap reported. If all goes according to plan, STSAT-2C will be delivered to an elliptical, 103-minute orbit that brings it as close to Earth as 186 miles (300 kilometers) and as far away as 932 miles (1,500 km), according to Yonhap. Few of South Korea's neighbors are spacefaring nations; in Asia, only Russia, Japan, China and India have demonstrated the ability to put payloads into Earth orbit. Others have tried and failed, including South Korea's erratic rival North Korea, which made its third and latest attempt this past April. Many analysts are suspicious of North Korea's attempted satellite launches — which have come in 1998, 2009 and 2012 — regarding them as thinly disguised tests of missile technology.